Metis offers data science training via 12-week full-time immersive bootcamps, evening part-time professional development courses, online resources, and corporate programs in various US cities. The Metis Data Science Bootcamp is designed by industry practitioners and provides students with on-site instruction, access to an extensive network of speakers and mentors, events, and ongoing career coaching and job placement support. Graduates will be comfortable designing, implementing, and communicating the results of a data science project, will grasp the fundamentals of data visualization, and will get exposure to modern big data tools and architecture such as the Hadoop stack. Successful Metis alumni will have skills in Python, Bash, algorithms, linear regression, machine learning, databases, D3, Hadoop, Hive, and Spark. The data science curriculum is delivered through project-based, hands-on, collaborative learning. To apply for the Metis Data Science Bootcamp, applicants need to have experience with programming and statistics, and complete 25 hours of academic pre-work. Metis offers an Admissions Prep course for those who need to brush up on their algebra, calculus, math, and Python skills. Metis is looking for students eager to get their hands dirty by learning new technologies and solving real-life problems, and who have the skills needed to secure entry-level jobs in the Data Science field. Graduates leave fully qualified for a data scientist job, with placement programs available to all graduates. Metis is also authorized to enroll international students with M-1 visas, which allow non-U.S. students to attend technical and vocational programs in the U.S. International students who are already in the U.S. on an F-1 visa may also transfer to Metis. 2 Years Later: Where are These Metis Grads? Considering applying to our Data Science Bootcamp but need to build or brush up on your basic skills first? Our Beginner Python & Math for Data Science course was designed for you, the beginner looking for an introduction to the building blocks essential to developing data science skills or forging a new career in the field. This course sets you on the right track, covering everything you’ll encounter during the bootcamp application process. You’ll learn: Basics of Python programming Common Python libraries: NumPy, Pandas, Matplotlib Foundations of linear algebra, calculus, probability and statistics Please note, the cost of Beginner Python & Math for Data Science can be applied to the cost of the bootcamp once you apply. We welcome all students looking to brush up on data science basics, not just those looking to apply to the bootcamp. Please visit our website to learn more and don't hesitate to contact us with any questions about Beginner Python & Math for Data Science, the Data Science Bootcamp, or any other inquiries. We partner with Skills Fund, an innovative financing company that offers financing options for students accepted to our bootcamp. Visit our website to learn more. We offer a $3,000 scholarship for women, members of underrepresented groups, the LGBTQ community, or veterans of U.S. military personnel. Visit our website to learn more. Once students are enrolled in the bootcamp, they are granted immediate access to our prework materials, a structured program of 25 hours of academic pre-work and up to 35 hours of set-up is designed to get admitted students warmed up and ready to go. This course takes you one step closer to becoming a data scientist by offering a subset of the topics covered in our Data Science Bootcamp. You’ll get a well-rounded intro to the core concepts and technologies taught within the bootcamp, including basic machine learning principles and hands-on coding experience. Plus, you’ll put it all to practice through a mini data science project of your own. We’ll cover the following: Data acquisition, cleaning, and aggregation Exploratory data analysis and visualization Feature engineering Model creation and validation Basic statistical and mathematical foundations for data science We welcome all students looking to brush up on data science basics, not just those looking to apply to the bootcamp. Please visit our website to learn more and don't hesitate to contact us with any questions about Introduction to Data Science, the Data Science Bootcamp, or any other inquiries. Students should have some familiarity with basic statistical and linear algebraic concepts. In Python, it will be helpful to know basic data structures. Overall, I really enjoyed the Metis Data Science Bootcamp experience! I came away from the program with a more well-rounded skillset that gives me a starting point for solving data science problems and additional reach-back to a network of other data scientists. I highly recommend checking out Metis if you’re interested in data science! If you're interested in more of my detailed thoughts on the Metis experience, including the people, curriculum, location, and resources, check out this post on my blog. The instructors were really really good, and I had a lot of fun learning all that material. The projects are well structured, and the syllabus is a very good overview of what happens in many (well, at least mine) data science companies. The coursework was a good mix of learning new topics, i.e. lectures, and hands-on work on programming challenges, projects, etc. I had full career support throughout my job search, even after I graduated from the bootcamp, and I definitely couldn't have found my awesome job without taking this course. I was part of the spring cohort at Metis Data Science Bootcamp and absolutely loved it. Everyday at Metis followed a similar schedule. We did pair programming in the mornings, followed by lectures, followed by coding. Over the 12 weeks we went through the basics of statistics, data science and data engineering, good programming practices, interview prep and much more. The instructors Bo Peng and Aaron Schumacher were both very experienced in the data science field and that wealth of knowledge definitely shown through in their lectures and their ability to field pretty much any question we could think of between the two of them. I also really appreciated all the assistance we got in the job hunt both in the application process. Lastly, I really loved my cohort. They came from such diverse backgrounds that everyone really added and brought value to the whole experience. Thanks to the bootcamp, I was able to find work within 2 weeks and am now working as a Data Scientist making a 6-figure salary doing what I love! The course supercharged by ability to use python for data manipulation and analysis. and it gave the the foundation to go on to learn just about anything I need to learn. This is a review for Metis Data Science Bootcamp (NY). As the title said it all, I think taking Metis Data Sciece Bootcamp is the best decision I ever made. Instead of spending $100,000 and 2 year of your life taking a master of data science in school, Metis helps you become a data scientist in 3 months and $88,000 less.The bootcamp is intesive (which bootcamp isn't? ), but they do make sure you get the best out of the 3 months with them. I have never been in and school/class where I learnt so much in 3 months. I went from knowing nothing about python to building app by the end of the bootcamp. The instructors are extremely nice and helpful, and super knowledgeable. They was able to answer all (seriouly, all) of my questions. Even on weekend, you will be able to ask them questions, and have the answer some time instantly. The job assistance is amazing. They will help you networking, fixing your email, your cover letter, anything... you name it. And the job assisstance goes well beyond the 3 months bootcamp, Metis talent team will help you until you get a job. They are very amazing. The bootcamp also have a lot of fun activites, thanks to our lovely coordinator. I enjoyed the bootcamp immensely. The teachers were very helpful and classmates were extremely nice. Metis also has a great HR team which helps students find jobs and prepare for interviews, etc. At the end of the bootcamp, Metis hosts a career day where each student has an opportunity to showcase their best work and meet prospective employers. The dedication of Metis' management, administrative, teaching and talent placement staff towards the career development and well being of the students/alumni never fails to amaze me. They deserve an A+ for their efforts in all aspects of program. For me, Metis was a positive and fun experience with a great collaborative environment and knowledgeable instructors. I personally learned a lot coming from someone with less computer science experience. I believe it did help me land my current data scientist position in terms of confidence in the field, d3 experience, and having data science projects to show. I would recommend the program especially if you are looking for a data science position that doesn't require a PhD. They do put you in contact with a lot of hiring partners as well. One of the best personal growth, and educational experiences of my life. The instructors are incredibly dedicated to the success of their students, and are seasoned experts and practicioners in the Data Science field. If you attend this course you will be among a very diverse cohort of students from wide ranging professional, educational, and cultural backgrounds. About 1/3 of our cohort had Phd's. Another 1/3 were fresh out of undergraduate with degrees in mathematics or comp sci. The remaining 1/3 had left their jobs at finance or tech startups to deepen their knowledge in the field. You can be certain that every student there will be incredibly intelligent and driven to succeed. You will make great friends, build contacts in the community, and will get plenty of assistance and advice in the hiring process. Your success will not be measured in grades or a diploma, but rather in how well you understand the material, and whether or not you'll be able to walk out of Metis ready to apply the new knowledge. Your skill level, competence, and employability in Data Science upon graduating is entirely on you. If you aren't interested or capable of fully immersing yourself in the course in and out of class, practicing coding and wrangling on your own time, regularly staying up late reading anything and everything related to the material, or proactively seeking assistance or advice from instructors, students, or members of the data science community - don't bother. You will not be a data science master in 3 months. Becoming proficient at the industry standard data science toolkit is like anything else - playing guitar, learning Spanish, etc. You need to commit to practicing constantly, or you simply will not build upon or retain the skills. Every hour of every day counts over the 12 weeks. Make the most of your time. Be prepared to continue practicing after graduation. At this point, it's all on you. If you can't commit to practicing and staying engaged after leaving, you will forget this stuff fast. Phd's and quantitative backgrounds may not be necessary for becoming a data scientist, but it certainly helps - especially in the job hunt. Once on the job search you will quickly realize that the expectations of data science applicants are exceptionally high. The data scientist is still a very coveted profession and in spite of the increasing demand, companies are still incredibly selective about who they'll even consider. There may not be an unlimited supply of Phd's out there with machine learning and database skills, but there are definitely enough for Google, Facebook, Apple, etc. Ultimately, the Data Scientist archetype at the moment seems to be someone who is a master in their field, extremely good at math, and very competent programmers. It is not a position for beginners. Any level of expertise, research, or advanced academic background you have will be important. Practice ahead of time. Do the pre-course work. All of it. I would highly suggest learning basic SQL before taking this course if you don't know it already. I took a semester off from college my junior year to do Metis and while I did have a few small issues with the bootcamp, my overall experience was very valuable and ultimately led to an internship + full-time job offer in data science. My cohort was full of very bright and motivated students which really enhanced my experience because many of my evenings were spent coworking and bouncing ideas/concepts off others. Metis does a good job filtering via interviews for students who will benefit the most from the program. I've also got a great network now of data folks as many from my cohort have gone on to awesome data jobs at companies like Google, Apple, Nike, Genentech, and IBM. That said, doing the bootcamp alone is nowhere near enough to land a serious data science job. Most who I know, spent an additional 3-9 months reviewing, studying, taking on contract work, networking, and interviewing after the conclusion of the bootcamp before hitting their payoff. Our two instructors (Debbie & Joe) did a really good job for such an intense program. Joe who at the time was teaching his second cohort is one of the best teachers I've ever had the pleasure of learning from. He has immense talent for explaining technical concepts and theory in a way that is simple and clear, and is amazing at addressing the very core of any followup questions. He was invested into the program and often stayed past 5pm, sometimes up to 7-8pm on the days leading up to a project deadline. Debbie was great as well, but came from a different background. She was forced last minute to teach our cohort, and thus had to deal with moving to SF from the east coast at the start. While she was also great, I would have preferred there be more organization so that our second instructor could be fully prepared for what feels at times like a 12-week sprint. All of Statistics - A Concise Intro to Statistical Inference, 20th Ed. I had wonderful experience at this bootcamp. The quality of students and instructors both were excellent. The job support after the bootcamp was excellent too. I attended the data science bootcamp at Metis in summer 2017. I was from a very different major gearing towards learning more on data analytics, thus in transition of career direction and expertise field at that time. Attending Metis has played a key role in terms of providing me very proactive education to accomplish the transition in such a short period of time. I truly learned a lot in many aspects from the education itself, how to really go out there and interact in the data science society/community, and last but not least how to efficiently present myself to the job market. I'd humbly like to say that I'm glad I decided to learn from Metis, which I believe ultimately made me able to currently work as a data scientist in the competitive industry. Great way to meet fellow data nerds. The curriculum is lacking though, and teacher quality is extremely variable. Poor career placement. Not worth the $$$. When deciding to enroll in a bootcamp, spending focused time on building skills and a portfolio are the draw, but really your biggest long-term benefit will be the network. With Metis, I have nothing but great things to say about the community. There's a culture of collaborating and learning-by-doing in the classroom. I loved taking three months to surround myself with smart people from diverse backgrounds and areas of expertise. I chose Metis primarily because of its focus on rapid deliverables and that I would walk away with a portfolio of projects to speak about with employers. But I've been amazed at the strength of the alumni community and don't know how I would begin to manage a job search without it. I was part of the earlier cohorts for Metis and found that they were still trying to smooth out their curriculum. I found the job assistance to be substantially lacking. They have career partners but none of them had hired former Metis alum which made me question their 'participation' in the bootcamp or if it was false advertising to potential students. I know some students have gone off to do awesome things, but I would say that this is the exception rather than the norm. At Course Report, we talk to tons of data science bootcamp graduates – most bootcampers are going to a data science bootcamp with the goal of getting their first job as a data scientist when they graduate. And that's most likely going to be a junior level job – a Data Analyst or a Junior Data Scientist or Apprentice. That first job is definitely one milestone in a very successful data science career, but how do you become a Senior Data Scientist? As you’re researching technology bootcamps, we’re willing to bet you’ll come across SQL. We see SQL in the curricula of so many different types of bootcamps, from Web Development to Data Science. With a wide variety of uses, and not many alternatives, SQL is a technology that you’ll arguably need to use no matter what job you get in tech. Jonathan Balaban, a senior instructor from Metis, joined us to answer all your SQL questions: what is SQL used for, which companies use SQL, and how you can learn SQL as a beginner! After working as an engineer in the water industry for 14 years, Carolina Gonzalez realized her learning had plateaued and she was ready to pivot her career. She saw the potential of getting into the data science industry in Seattle, but her Python skills weren’t strong enough to get accepted into Metis, a local data science bootcamp. 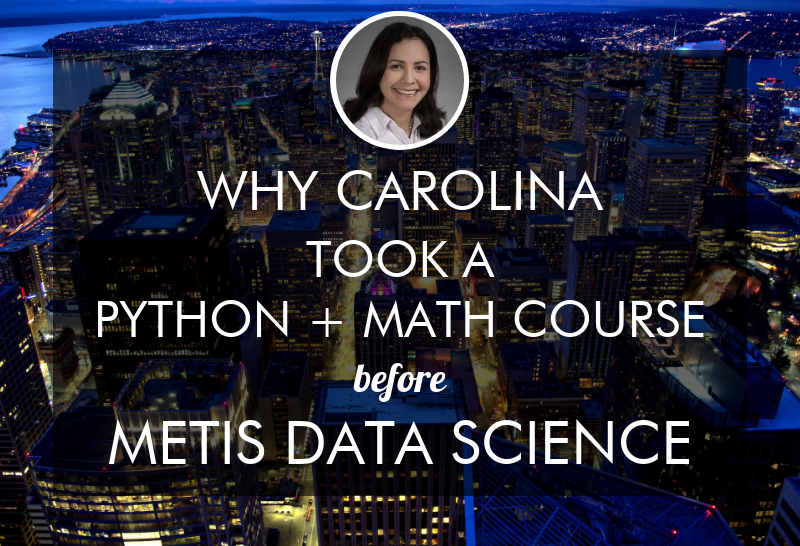 So Carolina chose to take the Metis part-time, live online, Beginner Python and Math for Data Science Course, to get ready for the rigorous Metis bootcamp application. Find out if Carolina got into Metis and what her plans are for the future! Tell me about your education and career background before Metis. My background is a blend of chemical engineering, a master's in Natural Gas Engineering and Management, an MBA and about 14 years of work experience. Most of my work experience is in the water industry at General Electric. I worked as a mechanical engineer, a process engineer, an applications engineer, and as a proposal manager. How did you first get interested in data science? I took some classes in business analysis at the University of Washington, and I started to get more interested in data science. I realized that there is big potential if you can analyze data and get some insights into what the data is telling you. I was very comfortable in my job, but I felt I had plateaued in my learning. I still have 25 years or so left in my working career, so I decided to pivot. I find it very intellectually interesting working with data and turning insights from data into actionable decisions. Since you’re based in Seattle, did you think about continuing at the University of Washington or teaching yourself data science rather than a bootcamp? I had to figure out whether I could learn the skills without spending a long time going back to school. The classes at the University of Washington mostly taught R. I learned a lot from those classes, but I needed more project-based experience. I also felt that to make a career transition, I needed to build a portfolio of projects and things that I could talk about with employers. Did you consider any data science bootcamps other than Metis? I looked into Galvanize and Metis. I had the opportunity to meet a couple of graduates from the Metis bootcamp. After talking with people from different backgrounds who went through Metis, they all convinced me that it was definitely worth it and spoke very highly of the experience and the instruction – so I started to lean more towards Metis. I also had a couple of conversations with the Metis admissions team to talk about specifics such as the curriculum, and metrics – like how long it takes for students to get jobs. What was the Metis application process like for you? Were you prepared for it? I decided I wanted to go to the full-time data science bootcamp at Metis, but I realized that I needed to learn Python for the Metis admissions process. I started learning Python by myself, but decided to accelerate the process by taking the Metis Beginner Python and Math for Data Science Course. What did you learn in the Beginner Python and Math for Data Science course? The class is six weeks long; the first half teaches mostly Python, and the second half is math. We started with a very basic level of Python – using the Jupyter network, then looking at how to define different types of data and properties of data, along with some of the main functions and manipulations that you can do in Python. From there, we covered visualizations and different features and how to modify those for different types of charts. We also talked about Numpy, the use of arrays and Pandas. The math portion covered linear algebra at the beginning, then very basic calculus, and probabilities and distributions. Even though I already had a math background, the Math curriculum was still a good refresher. I also did a lot of HackerRank exercises to get more familiar with the syntaxes, the code, the different errors, and to look at examples from the class. What was the learning experience like during the Beginner course? We had live online lectures twice a week on Mondays and Wednesdays, three hours each, from 6:30pm to 9:30pm Eastern Time. I had a chat window where we could post questions while the lecturer was teaching – that was very helpful. Another instructor monitored that chat window. The instructors posted the Jupyter notebook for each day’s class and all the presentations on the class GitHub account. There was also a communication channel where we could connect over video and audio with instructors, other students, and see the code for each lesson. When we learned the Pandas section, we were given a data set of NBA games; we had to use that dataset to answer a bunch of questions. Did you think the Beginner Python and Math course was worth the time and money? At the time, I was working full-time and I spent a significant amount of time per week on the course. But I think it was worth it. I learned Python a lot faster, and got an understanding of basic concepts a little bit easier. Having a stronger foundation made the full-time Metis bootcamp a bit easier. If I hadn’t taken the beginner course, it would have taken me a lot longer and I probably wouldn't have been able to do the bootcamp in summer. I would’ve had to wait until fall or winter. What were the other students like in your course? We started with around 22 people. Some would attend live lectures, and some would watch the recordings. We would interact mostly through the class Slack channel – we could post questions, and sometimes have a conversation through that. There were students from New York, from the Midwest, Chicago, and Seattle. The course was designed by Metis Senior Data Scientist, Roberto Reif. There were two instructors. The main instructor was dedicated to the beginner classes – he was very good and very entertaining. The second instructor was on the chat answering questions, and would sometimes talk during a discussion about a specific topic. What was the application and interview process like for Metis data science bootcamp? Did the Beginner course cover the questions that get asked in the application? The beginner course materials were very helpful for the application. Part of the application is about Python and come from HackerRank challenges, and after going through the Beginner course, it was easier to answer those challenges. But the specific admissions questions per se were not covered in the class. The first step of the application is through the Metis website. You talk about yourself and your experience. Then you do a little coding challenge on Python. If you hear back from Metis, they send you a link to complete a test within 48 hours. The first portion consists of questions related to math and Python challenges. For the interview, I had to talk about a proposal for a project. There was also a question about probabilities and a discussion about the project’s proposed variables. Now that you're in the full-time data science bootcamp, how prepared are you feeling compared to the other students who haven't taken the Beginner course? Some of my classmates have a lot of their career experience in programming, which is an advantage. But there are other students who didn’t have that experience and might have benefited by learning more Python before the class. The first week or two were really difficult, but after that, I think everybody kind of got up to speed with Python. What's your favorite project or assignment that you've worked on so far in the bootcamp? We are in week five and working on projects. It's interesting looking at different problems that you would like to solve and figure out if you can find the data on how to structure the problem. Hopefully, my favorite project will be the one that I'm submitting a proposal for today. As we learn more at Metis, I have more tools available for each project, so I think each project gets significantly more interesting. My proposal involves classifying startups as to whether they are likely to be acquired or go public. There are a lot of interesting problems out there, but finding the right data set is very important, and can be challenging. I think I have access to a data set now that will help me with my project, and I could complement it with other datasets and maybe web scraping. So far, what’s been the biggest challenge in learning data science? I think the hardest thing is dedicating the time to it. The good thing about the Metis bootcamp is that you’re putting everything else on hold and saying, "For this 12 weeks, this is what I'm going to do." But even then, there are other life responsibilities and things to balance. The more things you can take off your plate before starting the bootcamp, the more time you can spend actually working on your projects and the material. Is there anything specific that you are doing to make sure that you have enough time to focus on the bootcamp? I quit my job. That was one. Also, I organized my personal life differently. For example, at this time of the year, I sometimes go camping or do things like that, and I usually walk the dog in the evening. I've put off or delegated those activities to other people. I’ve shifted my activity system to make sure that I can dedicate the time to this. What are your goals for the future, once you graduate from Metis? Pursuing a career in data science! The main reason I'm doing this bootcamp is to work on data science projects. I live in Seattle, so one of my priorities is to stay in Seattle – there’s a huge tech base here. I think there are a lot of interesting problems to solve beyond physical science, chemical or mechanical engineering. What advice do you have for other people who are considering taking a data science bootcamp – should they take a prep course? I would highly recommend taking a beginner or prep course. 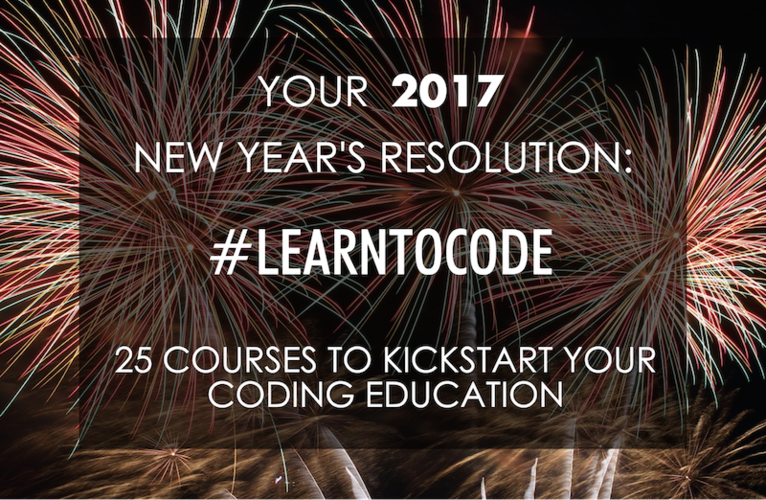 It’s an opportunity to not only learn the coding language that you will be working on, but also to get a taste of the material. I also suggest talking with people who have already completed the bootcamp. On the last day of Metis, the graduating cohort gives presentations. When I was researching bootcamps, I went to those presentations and it was helpful to see the projects they could complete by the end of the program. Find out more and read Metis reviews on Course Report. Check out the Beginner Python & Math Course on the Metis website. Over 1500 technology bootcamp graduates entered our sweepstakes competition to win a $500 Amazon Giftcard just by leaving a review for their school on Course Report. 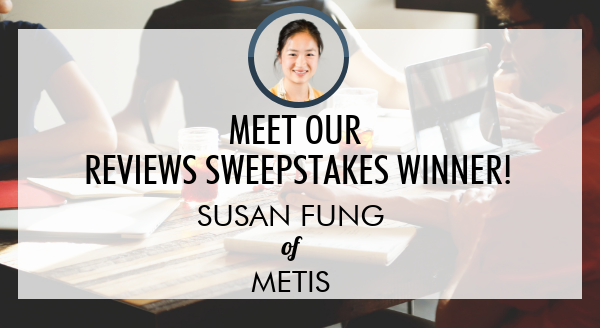 This time, our lucky winner was Susan from data science bootcamp Metis in Seattle! We caught up with her to find out a bit about her data science bootcamp experience, why she decided to attend Metis, and how she’s now working on a team of all women! What should you expect in a data science job interview and how can you prepare for one? We asked a Senior Career Advisor at Metis Data Science Bootcamp, Andrew Savage, to give us some insight into what candidates will experience when they apply to data science jobs. Find out examples of interview questions you might get asked (and what you should do if you don’t know the answer), the soft skills interviewers are looking for, and see Andrew’s favorite online resources to help you ace the data science job interview. Watch the video or read the blog post! Jamie Fradkin has worked at BuzzFeed as a data scientist for over a year and a half after attending Metis data science bootcamp in New York City. 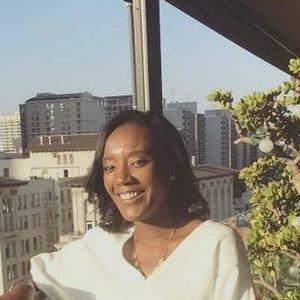 As a former biomedical engineer, she wanted to switch careers so that she could make use of her math and statistics skills in a booming new industry. Learn about the Metis application and learning process, Jamie’s experience getting hired and changing roles at BuzzFeed, and her tips on building confidence in your own skills. What's your career and education background? How did your path lead to a data science bootcamp? I went to Johns Hopkins and studied biomedical engineering and applied math and statistics. My first job out of college was at a medical device company where I was working in research & development making surgical tools, doing lots of mechanical work and quality testing. I was really passionate about that industry and felt it was something that would be a great fit for me, but I wasn't making use of the statistical or math foundation that I had built up in college. I heard about data science being a booming new career that had more demand for my skills and interests in a variety of industries and locations. After about a year working in the medical device industry, I decided to make the change so that I could best leverage my education, and have more opportunities and options for my career. I felt a bootcamp was a super smart and efficient way to go about leveling up my data science education as opposed to going back to school for a formal master's degree. In my research, I found that Metis had a really comprehensive curriculum with experienced instructors so I thought that would be a good fit for me. 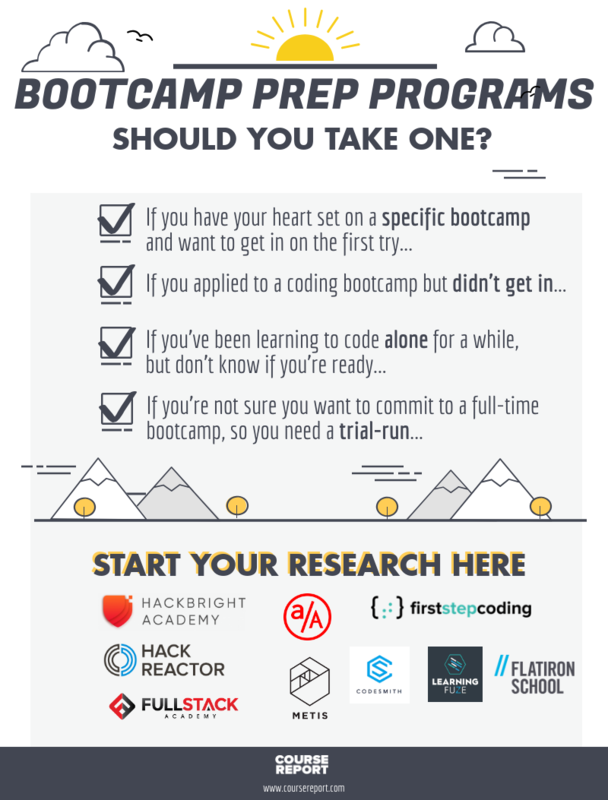 Did you consider going to a bootcamp for any other digital skills? What attracted you to learn data science? In a lot of technical fields, you can feel a bit out of touch with the actual strategy behind decision making. You provide reports and are the go-to person for technical questions but you aren't really in the loop on how that's affecting business operations. Data science is a great bridge between those hard quantitative skills and soft skills. It allows you to work with a lot of different kinds of people – you’re able to communicate your ideas to a non-technical audience for them to gain the most insights possible from their data. Data science is a really cool bridge between the two worlds – it’s a unique job. How did you find out about Metis? What stood out about the bootcamp and did you consider any others? My dad sent me an article about how college graduates with humanities degrees were going to coding bootcamps in order to develop technical skills that would make them more appealing in the job market. Even though I had two varying technical degrees, I didn't know anything about machine learning or visualization. I learned about Metis from my dad and it came at a great time. I applied to Metis and Galvanize, but it came down to location because I wanted to be in New York. I read Course Report quite a bit before I started and it seemed like a lot of people had phenomenal experiences so I was sold. How was the Metis application and interview process for you? Metis changed the admissions process a bit, but when I did it it was really open-ended. We had to craft a data science project and articulate to the interviewer how we would execute it. And of course there was a Python and SQL test. I liked how they tried to determine your curiosity, creativity, and grit, which is Metis' tagline. The process tested what kind of data scientist you would be if admitted. I'm not sure exactly how competitive it was, but I thought the application was pretty fair. How was your Metis learning experience? Did the teaching style match your learning style? I went to Metis in January of 2016 and I started my new position at BuzzFeed in May of 2016. Metis is 12 weeks so literally, every day counts. You can't slack off and you can't miss a beat. The structure of every day was perfect for what I had envisioned – you have a morning lecture and then the entire afternoon is time to work on assignments, projects, and ask your teachers questions. Every morning there was a lot to digest, but you could always ask your peers and instructors for help. It wasn't a typical college setting where you get a lecture and then they hope you understand it by Googling it. I felt there were endless opportunities to make sure we fully understood the topics we covered. I loved how collaborative the experience was. In a bootcamp, you really bond with your peers. Everyone is having a tough time because everyone comes in with different knowledge. It certainly wasn't competitive during the course because we all wanted to make sure everyone was up to speed. I had a great time. How did Metis help prepare you for the job search? I think similar to what I described about the actual curriculum at Metis, the career support unit provided endless opportunities to ask questions. So while there's no system where a career counselor is going to literally match you with a job and get you hired, I felt I had all the resources I could ever need to accomplish that on my own. We could get advice on what to wear to an interview, how to write an email to the hiring manager, or see if the Metis alumni network had any connections in a specific company. The career counselors were your friends. Metis gave a lot of general career education to bootcamp students as a whole, but they also catered to you on an individual basis to make sure you found the best fit for you. Do you have any advice for bootcampers who are going through the current job search? The people who have the most success looking for jobs are the ones who have a personal reason as to why they want to work at a certain company. You can spread your resume to as many places as possible and hope something sticks, but when I made it pretty far in the interview process or even got offers, it was really because I genuinely had an interest in the company's mission, and I really felt my skills would be a good fit for them. It's important to take time to think about the kinds of companies you want to work for and hopefully, your interest and your skills will shine through. You’ve been with BuzzFeed for about a year and a half. How did you find the position and how was that interview process? I found it by cold messaging a recruiter on LinkedIn, which I think I had done quite a bit back then. It actually turned out that another Metis graduate was already working at BuzzFeed – she was a phenomenal contributor to the company and had really excelled since starting there. So I think that actually helped my case quite a bit. One or two years ago, bootcamps weren't really a well-known concept yet. The recruiter connected me to the Metis grad and there was a phone screen. I also had an in-person technical interview, another virtual technical interview, and then there was a take-home assignment, which is where I was provided a data set of lots of stats around how users engage with BuzzFeed quizzes. It was very open-ended where they only said, "tell us some insights about this data." I made a presentation that was designed for a non-technical audience, which might mean people who write quizzes or people who work on distributing it across all social media platforms. My task was to essentially take a massive data set about how users interact with quizzes and give them some strategic recommendations based on that data. The interview process at BuzzFeed was long and challenging – around six weeks. But like I said before, I passionately loved BuzzFeed so before I started there they were able to see that. The take-home assignment was enjoyable for me. Describe why BuzzFeed needs a data analyst or a data scientist. Could you tell us about the day-to-day of your role? I’ve had two separate roles since working at BuzzFeed. One was more on the data analytics side, which is necessary at BuzzFeed because we have a huge team of content creators – people who write posts and make videos and quizzes etc. It's really important for there to be a feedback loop between our audience and our content creators so that we know what's truly working and connecting with our audience. So in that respect, a data scientist is really helpful to sift through all the page views, shares, comments and other engagement benchmarks to figure out what's working for us as a brand. Another side of BuzzFeed is we have a lot of what we call owned and operated properties like a website and app. I'm now working on the BuzzFeed app as a data scientist where I provide a lot of reporting and metrics on how users are engaging with content to help inform new designs. We are content agnostic because it's not about trying to decide what content to feature in the app since that's all done automatically. In the app we can control the design, the layout, and other features that we want to have. One main area of BuzzFeed data science is content and one area is products such as the site and app. Another is distribution, which is thinking about what we put on Facebook, Twitter, Instagram, Snapchat, etc. Are you using the same languages and tools that you learned at Metis? Did you have to learn any new technologies to work at BuzzFeed? Language-wise it's always Python and SQL, and we use Jupyter Notebooks just like at Metis. BuzzFeed does have a couple of in-house business intelligence tools that we're allowed to use. All in all, there's a ton of overlap with Metis. The only thing different at a larger company is that you're exposed to more production-level tools like Spark and Hadoop. When you need something to be fast and efficient for millions of reviews it's got to be production-level machine learning, whereas at Metis it was only small data sets. What was the learning curve like for you when you first started at BuzzFeed? A year and a half later, how do you feel you've grown as a data scientist? Part of what happens when you first start at a company is needing to get that domain knowledge. BuzzFeed is part of the media news and entertainment industries, so I had to learn what metrics matter to people and how we define success here. I had to learn what information to provide to our different stakeholders to help them best do their job. I've had a lot of great opportunities to extend my technical skills, take classes, and collaborate with other fellow data scientists. I think I've grown in the way that I communicate this information to other BuzzFeed employees. I’ve become familiar with the data that we have and how I can best serve everyone’s needs. Does BuzzFeed do a good job of onboarding their new hires and making sure that their data scientists are continuing to learn and grow? Around the time I joined BuzzFeed they were really interested in shifting the concept of a data hire from an analyst to a data scientist. We wanted to set that expectation of what kind of levels someone will be delivering at. It's really about providing results based analyses. The data science department has definitely grown quite a bit since I've started. We’ve hired between five or 10 new people in the past year. Another thing that I love about data science at BuzzFeed is the opportunity to have side projects. There isn't too much restriction on what you're allowed to work on because the leadership here realizes that data science is actually a creative pursuit. So if you have a curiosity about something that wasn't directly assigned to you, there's so much room for experimentation without negative consequences. We all learn from each other and share findings all the time. I think mentorship can come in a lot of different forms and it doesn't necessarily have to be someone who has a higher education level than you or even higher experience. It's just learning from someone who has different skill sets. In terms of your background in biomedical engineering, has any of that experience been useful in your current position as a data scientist at BuzzFeed? Knowledge-wise there probably was not much overlap. There is a fearlessness that I associate with that time in my life – not getting knocked down by any seemingly impossible task that gets put in front of you. I learned to have persistence and essentially be able to start a problem without conceptualizing what the solution would be. That's where I'd say the two fields overlap. What role do you think Metis has played in your success? If you didn’t attend a bootcamp like Metis would you be where you are today? It's hard to say what would’ve happened had I not gone to Metis, but I think it really helped to have an accredited program on my application. I technically could’ve just googled and looked up all the topics that Metis covered and maybe taught myself, but they had a really phenomenal reputation. Coming from that program certainly helped my case quite a bit. And for some reason, Metis instilled a lot of confidence in me even after a really short time studying in this field. The curriculum was so perfect because you did homework assignments and projects presentations that were similar to what you would really do in a data science role. I had the confidence to know that I could do this, I just had to find a company where I would love to do data science. Are you still involved with Metis alumni and instructors? Yeah. The first year or so after I graduated I went to career days and I was an alumni interviewer. I went to a lot of open house events and things like that. Every time they ask me to participate in something, be a speaker or connect with one of their students, I always say yes because I think it's really important to maintain the alumni network in this community. So I'm still relatively involved. I really feel that I owe them a lot for getting me to the level where I could have a job that I love. What advice do you have for people thinking about making a career change and attending a data science or coding bootcamp? I get this question a lot and it's hard because data science and data scientists are still terms that mean so many different things in different settings. My initial advice – don’t choose this career path because you think you should. Choose it because you want to and you think it would be a good fit for yourself. I'm assuming that whoever is going through this process has done enough research and knows that it's a career path that would be suitable for them. The other component of that is to not be intimidated by data science because there are a lot of scary graphs and terms. But I really feel that in a bootcamp setting, as long as you have the willingness to work hard and to learn, you can succeed with the support that a bootcamp provides. Essentially, if you're considering applying and you think you'll enjoy it, don't be swayed and don't be intimidated – have confidence. Read more Metis reviews on Course Report. Check out the Metis website! Can anyone learn data science? What do you need to know before you go to data science bootcamp? Do you need a quantitative degree? We asked Metis’s Chief Data Scientist, Deborah Berebichez, how to know if you’re ready for a data science bootcamp, and how to set yourself up for success before the first day of class. Watch the video or read the summary. In our recent Student Outcomes survey, alumni reported that they were working in over 650 different companies! Of course, you may have read recent press citing companies like Google who apparently aren’t willing to invest in junior technical talent from coding bootcamps (we happen to know that coding bootcamp grads have been hired at Google and Salesforce, but that’s not the point)... Here we’re highlighting 8 forward-thinking companies who are psyched about the bootcamp alumni on their engineering teams. Each of these employers have hired multiple developers, and are seeing their investment pay off. You’ve all heard about judging coding bootcamps and data science bootcamps based on their outcomes (aka does a bootcamp get students jobs), but we rarely get the perspectives of both the bootcamps and the employers at the same time. So we were really excited to have our guests, Megan Ayraud of Metis and Brennan Biddle of Capital One Labs, join us for a video interview. 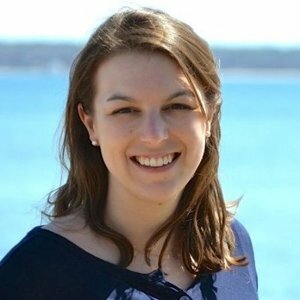 Megan is the head of careers at Metis, a Data Science bootcamp in New York, San Francisco and now in Chicago. Megan helped develop the 12-week Careers Curriculum, which is concurrent with the bootcamp curriculum at Metis, and provides a lot of post-graduation support for Metis students. Brennan is a Data Science and Data Engineering Recruiter at Capital One Labs in New York, which is an employer partner of Metis. It can be really difficult to sort through job placement rates and stories about bootcamp grads who've gotten jobs after graduating. In this live Q&A, Megan and Brennan answered all of our questions about how Metis prepares future data scientists for their first jobs, and how an employer like Brennan can hire effectively from a coding bootcamp like Metis. Megan and Brennan, can you first tell us a little bit about your roles. Megan, what does it mean to be the Head of Careers at Metis? Megan: As the Head of Careers at Metis, I work with all of our students and graduates on helping them through the job search within the current data science market. As you mentioned, I've built a curriculum that goes alongside our data science curriculum, and it's all about developing them in their career and getting them prepared for the job search post-Metis. There are workshops built into the 12-week bootcamp, one-on-one meetings, mock interviewing, and we bring speakers in who are data scientists in the community to help shine a light on what data science is like in their companies. I organize a career day at the end of every bootcamp cohort and we invite employers to meet our students and network. I also work with all of our students individually, along with my career advisors. Shout out to Metis’s amazing career advisors, who help find our grads amazing jobs. Likewise, Brennan, what does it mean to be a Data Science & Data Engineering Recruiter right now? Brennan: The fact is that the term data science means a million different things to a million different people. Even internally within Capital One, we're a big machine. Different groups in different corners of our business define data scientists differently. The hardest part is finding the right candidates that match up with specific needs of each individual group within our organization and finding where those technical strengths lie. Brennan, are there baseline requirements needed to be a data scientist at Capital One? Do candidates need a certain type of degree? Brennan: Really good question. I can't speak to everywhere, but here at Capital One, we want our data scientists to essentially wear a research and development hat coming into the door. Our Data Science organization is the most random, diverse, crazy, eccentric group of people you'll ever work with. Just sitting in my little pod alone, we have a Neuroscience Ph.D., a Math Ph.D., and a former high school math teacher. There's not one specific type of a person or background, either personal or professional, that we're looking for. I usually tell candidates the weirder background you come from, usually the more successful you'll be as a data scientist here at Capital One. That actually aligns really well with bootcamps because everyone who graduates from a bootcamp has a past life or career. Megan, how do you coach students on incorporating their past lives with their future lives as data scientists in just 12 weeks? That imposter syndrome is a common problem and we work with our students a lot, not only in groups and workshops, but also a lot of one-on-one mock interviewing. When we’re working on the technical interview, we actually bring data scientists in and have them actually go through a real live mock interview as students can expect in the real world. That helps build a lot of confidence in soft skills, and how to present your background and tie in your past life to your new life as a data scientist. It's amazing to see that transformation. A lot of people say, "I was a math teacher in my former life, how could I possibly tie that into data science?" As career advisors, we see that connection so clearly, but it's our job to help them develop that narrative, practice it, build confidence, and then be able to tell that story to employers. Brennan, have you hired Metis graduates? Brennan: We have hired a few! 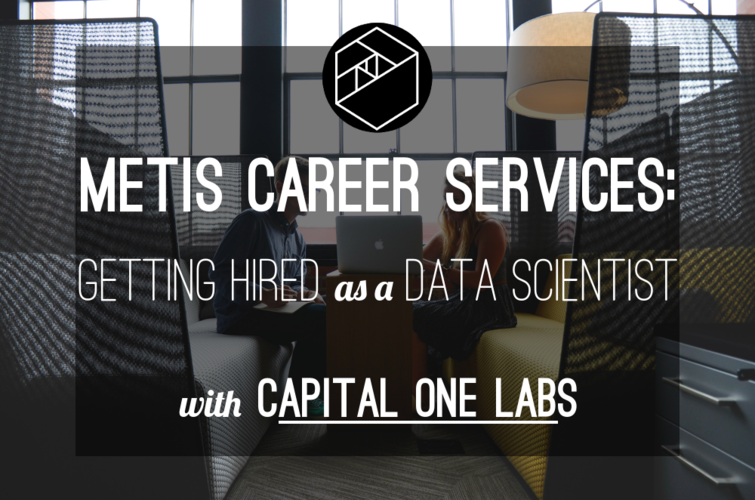 What types of roles are Metis grads going into at Capital One Labs? Does Capital One have a Junior Scientist role? Brennan: Yeah, we do. Even for a “junior” data scientist, we're looking for a really strong foundational data science background. This for us is someone that is really good a Python, has at least a little bit of exposure to working in a Hadoop framework, and someone that is interested in functional languages. We do have junior level roles (although they don't pay like junior level roles). We anticipate hiring someone that we can grow, mold and develop. And we find that places like Metis do a really good job of building that foundation that we can build upon. How did you meet the students that you've hired from Metis? At a career day or did you guest-lecture at Metis? Brennan: The answer is both. Metis has had a few cohorts and we've been working with them throughout. Our team goes to the Metis classroom, introduces ourselves to the cohorts, tells them what we do, and learn about the projects they're working on. The last cohort came in for a career day to see our office space and interview and they asked a lot of questions of different data scientists on different teams. Metis has a career night that we attend every single cohort as well. At this point, we have a pretty good relationship with them at different stages in their process. We work a lot on building brand within the bootcamp as well. Now that we're hiring, we're starting to build a bit of a reputation and by bringing people in to see our space, telling them about the projects that we do, I think that we're starting to generate a lot of interest. Megan and Brennan, I want to talk about what goes into a technical interview for data scientists. What would I expect as a data science candidate? Megan: I see employers do things really differently. There is a lot of overlap from coding interviews for software engineer roles to data science. I see most of our grads having to do some level of whiteboarding. They may not necessarily be coding on the whiteboard but instead walking through a solution, how you would approach it, and how you would get to an answer. At Metis, students do whiteboarding practice almost every day. They’re pair programming all the time at Metis, so they feel comfortable doing that with an employer on an interview. We also see companies incorporating case studies into the interview process. Case studies are just a huge part of the data science world. Sometimes those are in the office, sometimes they’re take-home projects that the candidate has to be ready to present in front of an audience at the interview. Communication is such a huge part of the data science role, so candidates have to show communication skills, logic and technical skills, and also portfolio review. At Metis, students build five projects along the way so that they have this robust portfolio to show employers. I see a mix of those three things happening in data science interviews. Brennan, of those three things: communication skills, technical skills, and portfolio, which stood out the most about the Metis students you have hired? Brennan: I hate to give a floppy answer but it really is a mix of all of three. Our interview is a four step program. I warn our candidates that during our interview process, they may be asking themselves, "Am I interviewing for a software engineering job or for a data science role?” We really do test those Python and Scala skills in our candidates, but our interview process is pretty detail-oriented and by the end of it we have a good feel for their analytical abilities, their mathematical abilities and their culture fit as well. And we try to paint a nice, complete picture when making our final decision on our candidates. Do any of the Metis students you’ve hired have PhD’s? Brennan: Megan, correct me if I’m wrong, but I don't believe they do. The people that we've hired don’t come from traditional computer science background. Megan: One person has a Masters degree in Math, which is relevant, but not computer science. Another person had a bachelor's degree. Has it ever been a concern for the Capital One Labs team that those students didn’t have PhDs? Brennan: Generally speaking, in our data science community here at Capital One, not many of them come from a traditional computer science type of background. Of our Ph.D.s, we legitimately have a Ph.D. in theology all the way through to astrophysics and everything in between. A few of those are computer science backgrounds but not all of them. Brennan, how do you ensure that new hires at Capital One Labs are supported as they continue to learn after they had graduated from Metis? Brennan: Absolutely- I think that's the hardest thing for me to portray to candidates as a recruiter. At Capital One Labs, we have a large community of data scientists all over the country- San Francisco, Chicago, New York, DC, Dallas- and that community of data scientists is really supportive. We know most of one another on a first name basis. We have our own internal Big Data Academy as well. We have meet ups internally where we all meet in one city and catch up with one another. Capital One is a great place to work as a data scientist for several reasons, but the one that's hardest to portray is the community within the Capital One culture. Capital One is a really big company but as a data scientist it feels more like you're working at a big start up with around 100 to 200 people as opposed to a huge bank with 50,000 employees. They all know each other very well, have lunch together every single day, and travel to see one another all the time. It's a really tight-knit community of people. Megan, as you build Metis's employer network, how important is it that your employer partners provide mentorship for your graduates? Megan: That's something we definitely look out for, and we hope to partner with those types of companies. We see our students and our grads being selective for those types of opportunities as well. Unless they're coming to Metis with a lot of professional experience already under their belt – and we definitely do have that profile of a candidate – then they may be okay in a less mentorship-driven company. But to find an employer like Capital One Labs is just so awesome for our students. We've also started working with employers on building out apprenticeship programs and that has been very successful. And really the model works. We have tried 8 to 12 week maybe even 16-week apprenticeships where they can come in, work on real projects for the team, and there's a heavy mentor component to it. They can get up to speed in more of a comfortable but accelerated pace, and when they come on full time they're ready to go from Day 1. Do you see most Metis graduates going into straightforward Data Scientist roles or are there other types of roles that students can get when they graduate from Metis? Megan: The title that we most often see is Data Scientist. We also see Data Analysts or some analyst position. Data Engineer is usually the third title we see. What have you seen your most successful Metis graduates do differently that really sets them apart as candidates for data scientist roles? Megan: First, how do you define “successful?” In my eyes it's a student who lands a competitive data scientist position at a company that they're super passionate about within the first month or two of graduating from Metis. When I see people following that path, they've been incredibly engaged during the bootcamp and also they're all-in with careers. They're just soaking up the advice and all the tidbits of information that we that we put out there. The most successful Metis grads are juggling and balancing a lot of or spinning multiple plates at once. They're building their projects, they're learning, they're involved with the career team, they're getting their resumes together, they're interviewing. Juggling everything is a lot to ask, but they're able to handle it gracefully and confidently. After Metis, they have a plan. They're not taking a few months to just relax, they're aggressively attacking their search and taking all the advice that we've given them and totally utilizing their network that we helped them build and just going after it. I see those people with the most offers, having the most options, and feeling most successful out of Metis. Do you recommend that students start applying for jobs the second they graduate from Metis or should they wait a couple of months after they graduate to improve their portfolio? Megan: I think personal comfort level factors in, but we see a lot of people starting to get a little antsy about their search around Week 9 of the bootcamp. They’re starting to think of their list of target companies to start applying to and researching. Around that time, they may start putting out some applications and start getting some coffee meetings with hiring managers. By career day, they're starting to more actively apply. I think that's a pretty good timeline to start things off. Do Metis and Capital One Labs have a nice feedback loop? If you notice a new hire is lacking in one subject, are you able to give that feedback to Metis? Brennan: Yeah, fortunately we haven't seen any gaps to relay back to Metis. Capital One has a relationship with Metis on several different levels. We partner with them in all kinds of different ways. So there’s a nice give and take between our relationship as far as helping them help us and vice versa. Megan: We have a close partnership and it's been great to work with them. They've definitely given us some awesome feedback on career day and that has certainly evolved drastically over the couple of years that we've been running bootcamps. It's just awesome to get that advice because they're the ones that we're doing this for and their feedback is so important to us. Brennan, will you hire from Metis in the future? Megan, there’s a lot of talk about how to report outcomes and the methodology behind those statistics. Is Metis planning on publishing an audited report anytime soon? Megan: We're definitely thinking about that very seriously. We are actually accredited by a company called ACCET and we have to go through an audit process frequently. We have to submit verified employment data once a year. Our numbers are very much accurate and if they weren't, they would shut us down. We are under very strict guidelines on how we report that data. Brennan, last question. What is your advice to other employers who are thinking about hiring from a bootcamp or from Metis in particular? Have you found the secret sauce to navigating through the bootcamp world? 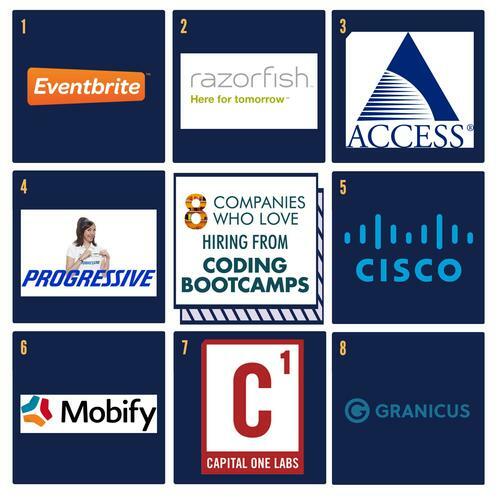 Brennan: The hardest part about hiring from bootcamps is that they essentially open the floodgates and all of us potential employers are all trying to find the top talent from the bootcamp all at once. The hardest part for us is having an interview process that selects the top talent and making sure that they are the right fit for our role, but then also being fast enough and agile to work with Metis grads as well because there's so much competition for this talent. My advice is to start early and build a strong relationship with the bootcamp and then build out a process that can effectively and quickly hire the right people. Is there anything that we totally skipped over that either you Brennan or Megan want to make sure our Course Report readers know about? Megan: It’s been great working with Brennan and the Capital One Labs team and we look forward to more partnerships and continuing the relationship and hopefully getting even more Metis grads onto their team in the future. Thanks so much to Megan and Brennan! To learn more, check out Metis reviews on Course Report or visit the Metis website here! See our most recent recommendations for summer coding bootcamps here! If you're a college student, an incoming freshman, or a teacher with a summer break, you have tons of summer coding bootcamp options, as well as several code schools that continue their normal offerings in the summer months. Since launching in 2013, Metis has always partnered with leading tech companies to design their bootcamps- they teamed up with world-renowned Rails shop Thoughtbot to develop their Web Development bootcamp, and partnered with Datascope Analytics to design their current Data Science bootcamp. While we’ve chatted with instructors and curriculum designers at Metis, this is Course Report’s first time talking with Metis students! In this Alumni Q&A, Emily and Itelina tell us what they were up to before Metis, their data science bootcamp experience and their lives post-graduation. Liz: What were you up to before you started at Metis? Tell us about your education background, your last job, things like that. Itelina: I graduated with a degree in mathematical economics from Princeton University four years ago. In the last four years, I’ve been working as a management consultant at Price Waterhouse Coopers. I work mostly with healthcare clients such as hospitals and insurance and pharmaceutical companies. I did a lot of projects that involved solving problems with data, so I was often the lead on the analytics work stream. I worked on analyzing data from hospitals and insurance companies and seeing different patterns in cost of care and quality of care. That got me really interested in solving problems in data, and I also did some of that in my undergrad degree. I really wanted to find a program where I could the latest techniques, technology and tools, and Metis was the perfect program. Liz: Itelina, what clicked and made you think, “I want to be a data scientist, go to a bootcamp and get that data science job after I graduate”? Itelina: When I was an undergraduate doing economics research, I used statistical software to analyze data. When I was consulting, analyzing data wasn’t always the primary focus because I was part of a group working on strategy. But we started working with clients who had increasingly larger data sets. Very early on I realized that some of the traditional tools used in data analysis, such as Excel, were obviously not powerful enough to do the kinds of analysis we needed with larger quantities of data. So I started taking courses online forum Coursera. I took the data science specialization track and I learned a R and things like that. That made me realize that there are a lot of technologies and tools out there and that I wouldn’t be able to focus on learning all of those technologies while working at my job. That made me realize that I wanted to attend a bootcamp program. Liz: Emily, you mentioned doing a night statistics class, right? Emily: I did some online courses as well. Not through Coursera, but I did one that was through EdX. Liz: Did you ever go to meetups or workshops before you thought about plunging into a full-time bootcamp? Emily: I hadn't been to any meetups before. I did go to the open house that Metis had just to check them out to see if this was really something that I was interested in, but I wasn’t really going to meetups. I did some in person courses as well as the course that I did through EdX. I was sold on the idea after I went to the Metis open house. After that, I researched the other boot camps in New York, and I felt like Metis really stood out to me. Liz: Itelina, did you also look at data science bootcamps in New York? Itelina: Yeah, I did. Honestly, I considered graduate school programs vs. bootcamps. I figured that doing the bootcamp would be good for me because it would be a shorter program, more practical. I looked at some of the other bootcamps in New York City. There’s a bootcamp called Data Incubator; they’re geared more towards students with PhDs. There were a couple of other programs, but I just thought that Metis was great for what I was looking for because of its instructors, full day program and the curriculum, so that was why I chose it. Liz: Emily, what were the other boot camps that you looked at? Emily: I can’t remember the other ones that I looked at but I looked to see which ones were being offered in New York. The main reason I chose Metis is because they had their curriculum published. I think there was another bootcamp in New York that was teaching mainly R, and I was more interested in Python because I felt like it’s a language that’s very versatile and can be used for so many different things. They touch on so many different languages like D3, which I wanted to get better at. We did a little bit of SQL, MongoDB and Hadoop. I wanted the full breadth of languages. Liz: Tell us what the application was like? Did you have to do a coding challenge in a certain language? Itelina: For the application process at Metis, you do a take-home challenge. You’re required to do it in Python but you can do it at your own pace at home. There’s a set of problems for you to solve with descriptive results and answers. There was a video interview with one of the instructors. They do test your background but it wasn’t intense or difficult. Itelina: I knew how to do data analysis in R but when I got the challenge from Metis, I said, “I need to learn how to use Python,” so I looked through a book and did the challenge. Liz: How many people were in your cohort? Itelina: I think about 20-25 people. Emily: I think it was 21. Liz: Did you find it to be a diverse class in terms of age, gender and race? Itelina: In terms of gender, definitely. I think half of our class were girls and half were guys. Age, definitely; we had people who recently graduated from college and people who were trying to make a mid-career change. We had people who were born outside of the U.S., so definitely a lot of diversity in backgrounds. 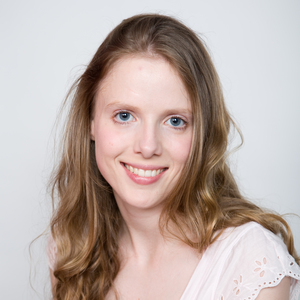 Liz: I’m not super familiar with the world of data science but is it fairly male-dominated? Emily: I’m not sure because I feel like it’s such an emerging field. That’s one of the things that I considered when I was looking for a job after graduation. There are many people trying to hire data scientists right now. I’ve met people who ask what I do and I say I’m a data scientist and they say, “My company’s been trying to hire a data scientist for months and months and they can’t find anyone.” That could be because there are more positions to fill, but it could also be that different companies are looking for someone very specific to fulfill their needs. I don’t know yet how if I feel that it’s a male dominated field; possibly. Liz: Who were your instructors and was it important to you to research the instructors? Emily: It was important to me. I was actually a bit disappointed because when I first went to the open house Irmak and Bo were instructors at the time. I met them and thought they both seemed really nice. I was excited for them to be my instructors then they weren’t. But, the instructors for our cohort were also pretty amazing. Before it started, I looked at their LinkedIn profiles and Googled them to see what their backgrounds were. They were definitely very qualified. Liz: Who were your instructors? Emily: Erin Schumacher and Jon Hanke. Liz: What was the teaching style like? Itelina: The general format for the bootcamp is lectures for a couple of hours in the morning and some pair programming problems to improve our coding style. In the afternoon it’s mostly individual work on projects. The instructors are available and you can ask them any questions or ask you can ask your classmates. It’s half structured, half individual work. Liz: You’ve both done a traditional 4-year degree. What did you think about the teaching style compared to a traditional university classroom? Itelina: I thought the format was very innovative. It’s project based so every two to three weeks we do a project and make presentations. It’s very practical and simulates a real work environment where you’re delivering results in short time periods. I thought it was a very innovative learning model because you’re learning and doing. At the same time, we have good coverage of the theory behind the different models and the technology tools. Emily: I thought so too. Having the unstructured time in the afternoon — it was sometimes hard to stay focused, but it did replicate a real work environment in that you don’t always have someone looking over your shoulder and telling you “You need to do X, Y and Z.” You sometimes have to figure that out for yourself and manage your own time. Liz: Were there also teaching assistants or former students that were around to help? Itelina: We had one teaching assistant. She was around to help everybody with the problems sets as well as the questions so we had very good support. Liz: Was there a good feedback loop with Metis? Emily: We had one-on-one meetings with staff members including one of the co-founders. They like to do that a few weeks in to see how it’s going for you and to see what’s working for you and what isn’t, so that they can make real-time adjustments to the course. They encouraged us regularly. Occasionally they asked us to fill out anonymous surveys. Itelina: I definitely agree. They were very active in getting feedback and making adjustments on the spot. If there was a particular topic that we wanted to cover more, they would schedule an ad hoc session in the afternoon during our free time. It was a very good process. Liz: Did everybody that you started with finish with you? Emily: I think we had one person who started who left after the first week. The other 21 people made it all the way through to the end. Liz: Did you have tests or assessments throughout or was it mostly project based? Itelina: We didn’t have tests; mostly project based assessments. Liz: What technologies did you learn at Metis? Emily: Python was the main language that we used. For different projects we were encouraged to use different technologies. SQL, Mongo DB, Hadoop, D3, Hive, Spark —we covered those and you could use them or not, depending on whether they were necessary for your project. Other people with more advanced knowledge coming into the course got into Neural Nets, but that wasn’t explicitly taught. Liz: Emily, you mentioned your background and wanting to get into data visualization; were you able to do that at Metis? Emily: You could go as far into D3 as you wanted to, but there was a lot of emphasis on communication. The three main things that they talk about are programming, statistics and communication. At the end of a project when you’ve done all the complicated statistical models, you need to explain it to your client or the stakeholders in the project. A lot of the communication comes from data visualization. That was discussed and we were encouraged to explore that. Liz: Itelina, can you tell us about your favorite projects? Itelina: For one of my projects I worked on some data that was published in a Kaggle competition. Kaggle is a company that hosts a lot of predictive modeling competitions. Sometimes a company will say, “We have this data set and we’re looking for someone to develop a predictive model on this outcome.” Kaggle will host this challenge as a competition and there is money involved, so people compete for these prizes. There’s a leaderboard where people see their scores. It’s a great resource for keeping up with the latest techniques that people are using as well as data sources. I used Kaggle to get a set of data. That data set contained information on patients and their medical records. The topic was predicting a person’s risk for developing type 2 diabetes based on their past medical record. For that project I worked on developing a predictive model for a person's risk for diabetes based on these other factors. That was definitely an interesting project. Liz: I love that because it’s clearly your former career influencing the way you use data science skills to solve problems that you couldn’t have solved before. Did you work on it alone or with a group? Itelina: For that project I worked with a couple classmates who also picked healthcare related topics. Another classmate focused on the wellness aspect. She was analyzing diet and blood pressure, and how that correlated to their risk for certain diseases. Somebody else did something similar with heart disease. I worked with a group collaborating on similar topics but on different angles. Liz: Emily, what was your favorite project? Emily: It was probably my final project where I did some analysis of UN data. It was for a data visualization challenge that the UN was hosting on the Millennial Development Goals. It was a 15 year project in which the UN focused on specific goals. One goal concerned curbing the spread of different diseases. I focused on HIV data, and found some interesting things going on with the spread of new cases of HIV in Sub-Saharan Africa. I looked at which countries were able to stop the spread of HIV. It was hard to determine causation in the data, but I managed to come up with some interesting visualizations. I was a finalist in the competition. Also, the UN took notice of me and offered me a job! Liz: What are you up to now? Emily: I’m on a short term consulting contract with the UN right now. I’m working on a dashboard exploring some data related to climate change. Liz: What was that process like? Emily: I sent it to them because I had to make the entry into the data visualization challenge. Also, my school had a contact at the UN because they were hiring. I sent in an application and got an interview because they saw the work that I did for my final project and thought it was good. Liz: I’m assuming you’re using data science skills for this project. Emily: At first when they were telling me about the project I was a little bit scared. I knew it was only a three-month contract and I thought, “You want me to do all that analysis in three months? You want me to solve climate change in three months?” But they have a lot of analysts who’ve been working with this data for a couple of years. I am working with a team of people who are figuring out how to present it and build the dashboard. Liz: What is it like transitioning from a bootcamp into a real data science position? Emily: At first it was difficult because I’ve worked on so many of my projects individually. I had to figure out how to setup a workflow in terms of code. On the other and, I really feel like I need to shake my imposter syndrome because I feel like I have so many skills. I’m working with people who are also very skilled, but I don’t feel like my skills are sub-par. Liz: Itelina, what are you up to now since you’ve graduated? Itelina: I’ve been doing a lot of job searching. I would say the process has been a lot better than I would have expected if I was just searching for jobs on my own because Metis provides a great network. We have great career services and great support. In fact, before I graduated from Metis, I actually had a job offer. I think Metis really does a great job of making the right introductions and connecting you to the right companies that are a good fit for your skills. I’m looking for a job where I can grow my career, so I want to take a little more time to talk to different companies and see what’s out there. Liz: What’s your dream position? Itelina: I definitely want to work for a company that has a really good vision, so a company that will make an impact on our society. I’m looking at opportunities in mid-stage startup companies, although not exclusively. I’m looking primarily for opportunities in healthcare, but I’m looking at opportunities in other industries as well. Definitely a data scientist/analyst type of position. Liz: What is Metis’ approach to job preparation? Did you do mock interviews, resume building? Emily: We did all of the above. They did a really great job. We had workshops on writing resumes and cover letters. We also did a mock interview where we were actually whiteboarding. We had the opportunity to do interviews for soft skills and one-on-one meetings with career staff. Sometimes it felt like it was a lot to take in while learning so many things, but it was really supportive. I still communicate with the career staff. They still respond if I want them to look over a cover or some changes I’ve made to my resume. Liz: Itelina, you’ve gone through a number of data science interviews with different companies. Have those been set up through Metis or through your own network? Itelina: Partly through Metis and partly through my personal network. Generally Metis makes an introduction or tells us about a certain opportunity. We take it from there and see if there’s a fit. Liz: What is a data science interview like? Itelina: It’s actually very different from company to company. I’ve interviewed with companies where all that’s required is a take-home challenge then going to the company and meeting people and seeing if there’s the culture fit. I’ve had other companies ask me to solve math problems. They would ask me to do that for an in person interview as well, and I would have to make a presentation to an entire group on a past project and defend my work. I’ve had interviews where people asked me questions related to SQL. I think it’s different depending on what each position is asking for. Liz: What has been the reception of you being a bootcamp graduate? Itelina: People are generally interested. At almost every interview people ask me to describe what the program is like and the things that we do and how they teach. People are definitely interested in that kind of background. They’re interested in how well it prepares you for the kinds of problems you have to solve in a real job. Liz: My last question that I ask everyone is was it worth the money and would you recommend it? Do you think that you could have learned everything you learned on your own? Emily: I would say yes, absolutely. I think it was worth it. It was a challenge. It was really intense but I don’t think that I would’ve gotten all of this knowledge on my own, especially in this short amount of time. I’m continuing to reinforce that knowledge and add to it with projects that I am working on. I really don’t feel like I could’ve downloaded all of that knowledge into myself in any other way. Itelina: I absolutely agree with everything Emily said. I would definitely do it again in a heartbeat. It was definitely worth the money. The learning environment, having the type of classmates that you can learn from, the instructors — you definitely couldn’t have gotten it just by learning on your own. Again the Metis hiring network is also really great, so I would definitely recommend it to anyone. I wish the program was longer so that I could stay there and learn more! Liz: Anything you want to make sure people know about Metis, bootcamps or data science in general? Emily: There is a lot of talk about data science because it is one of these fields where there are more open positions than there are people to fill them. I would say to do one of these courses, a masters or a bootcamp, you really have to love working with data, love a challenge and love problem-solving. You have to love working hard. I don’t think it’s something you can do just because you want a guaranteed position and a decent salary. You have to love this kind of work. Itelina: I would say anybody who’s looking to get their foot in the door in data science or looking for a change should check out bootcamps. This type of program is very innovative. I benefitted greatly from the program so I think it’s great for somebody who is trying to start a new career. Would you like to learn more about the Metis data science program? Check out their Course Report page. Did you miss the last Metis Data Science Open House? Catch the replay, along with some of our favorite moments from the panel Q&A, here! Welcome to the January News Roundup, your monthly news digest full of the most interesting articles and announcements in the bootcamp space. Want your bootcamp's news to be included in the next News Roundup? Submit announcements of new courses, scholarships, or open jobs at your school! Welcome to the August News Roundup, your monthly news digest full of the most interesting articles and announcements in the bootcamp space. Want your bootcamp's news to be included in the next News Roundup? Submit announcements of new courses, scholarships, or open jobs at your school! Want to be a UX Designer? Find out How at our Webinar with Metis! Join Liz of Course Report and Laurie & Irmak of Metis on Tuesday, July 22 for a free webinar. You'll also have a chance to ask any questions you have about the Data Science course at Metis! Since launching their Ruby on Rails bootcamp in Boston, Metis has expanded to new cities and added courses in new fields. Their upcoming Product Design course in New York aims to prepare students for a job in the growing field of UX and Product Design. We talk with Alex Baldwin, co-creator of Metis Product Design Curriculum, about the differences between UX Design and Product Design, why the bootcamp model is great for this subject, and the types of students who will excel at Metis. What is a product designer and how is it different from a UX Designer? Never have I met another industry that cares more about what they call themselves. Are you a UI or a UX? Usually, you’re doing a lot of everything. So I see product designers as people who are not afraid to just jump into something. Some days, I’ll be doing database stuff. I might not be the one to write the queries but I’m the one that’s going to bring attention to that problem and make sure that resources are allocated to fixing it. There’s definitely been a push in the last couple of years; designers are becoming more of marketers and using growth hacks. It’s definitely bringing design and marketing together. It’s really fascinating to see something like the Dropbox case study of how their referral program allowed them to be enormous. Our clients at thoughtbot request types of features like that, and being able to attach a growth loop onto something that people really desire is a fantastic way to make sure that you stay interested in your product and people are using it and recommending it once it’s good. When it comes to products, you have to look at flows, user interfaces, functionality, measurement and research and there are all these other aspects to consider. Why do you think that the boot camp model will work for product design? I think our boot camp model is wonderful because the last month is all about passion projects. We’ve identified that there’s definitely this need when people join bootcamps, specifically those who want to do product design, that they have something in their portfolio that they can show. They care most about getting feedback on their work and getting those as close to done as possible. Doing this learning in the classroom setting is way easier; students sit down, map out where they need to go, and the instructors can go through and evaluate how to get them there most efficiently. I think that in-person feedback is really important. So, having the dedicated 3-month period of time where this is the only thing they’re focused on is what will really be successful. What sort of student are you expecting? Are you expecting somebody who has to have a passion project in mind? Do they need experience in coding or web design? First and foremost, they should have some sort of background in graphic design. I think if you already call yourself a designer and you have a portfolio, it doesn’t really matter what’s in that portfolio. It could be illustration, marketing pages, it could be anything about design, whether it’s UX or not. There are no “last job” requirements. What we really care about and what we’ll be interviewing for is people that have been satisfied with their work but they crave more. They want more of a connection with the people that they’re making these projects for and they want to make sure that the projects work. Will you all have a technical challenge or will it be more of a culture interview? Have you thought about what the interview will look like? Yeah; the course does include basic HTML and CSS. The reasoning for that is it’s hard to get things to completion when you don’t control that stack. If you’re waiting on someone else to finish part of your work, you’ll just have to sit there and wait. So I think we’re going to spend a lot of time building those skills. There’s not necessarily a technical challenge, although we are going to have people do a graphical challenge. We want somebody to produce something… Even if it’s really bad, that’s fine; we just want to see where people’s graphical skills are. But I can’t tell you exactly what our challenge is! Will students have pre-work on HTML/CSS? Yep, we have two weeks’ worth of pre-work, and all our pre-work consists of custom tutorials that we’ve written ourselves. We just want to make sure that they’re versed in the software flow and are able to scale up those skills pretty easily from the beginning. What has it been like to design a curriculum for a fairly new subject matter? This has actually been super fun because there’s nothing else to go off of. We took the core cases of interaction design and made those cases stick together really well. We looked at the key abilities and how we could increase people’s yield in those activities. We’re doing these weekly exercises and they’re really meant to push you into getting to being in a production role and thinking about the whole loop of products. It’ll be really cool to see how many different variations of the same assignment turn up. We are all really excited. So will students do those 7 projects over the first 2 months and then they work on their passion project? The structure is 7 weeks of lectures and exercises- there are no abstract lectures. One day we’ll talk about data analytics. At the end of that lecture, they’ll translate that concept into an app. The way the lectures work is that the co-instructors will trade off. You’ll have one person taking one day and the other will be walking around and helping students while the lectures are going on and answering questions. Then we also have a team project that we’re going to put together. We want to group some of the designers in teams of 4 or 5 and have them work on a behavior builder. What I like about the behavior builder is that it’s really easy to see how people interact with this in real life and measure it’s success, as opposed to hey, let’s release a music app and maybe it’ll do something or it won’t. It’s very clear whether this action is happening or not. In talking with students, I hear a lot of feedback saying that they want to work as a group and do team projects so they’re prepared for that in the real world. It‘ll be super fascinating because these students aren’t all going to be from similar backgrounds. They’ll realize that one person is clearly better than them at graphic design, so they should be the visual designer of this project. One person has done research before, so they should fulfill that role. And just seeing how those roles specialize and how they work together will be neat. Will the Metis Product Design bootcamp have “personal investment days” like the Ruby on Rails bootcamp does? I think with the Rails bootcamp, they have Knowledge Bomb Fridays with friends of thoughtbot and employees. They also have Fireside Chat Tuesdays that are employer-focused, where they have people speak from hiring companies and they’d bring in a Head of Engineering to talk about something that’s specific to that company. We plan on doing similar things with guest speakers from the community. Have you had to think about working the outcomes into the curriculum like doing job placement, interview practice and stuff like that or are you letting Metis handle the brunt of that? Metis is handling most of that. They have a really awesome talent placement manager that we’ll be working with and they’ve done great work. I think the hiring percentage out of the first bootcamp has been strong, and it’s only been a few weeks. For me, I’m thinking how can we get someone in 3 months to be hirable at thoughtbot? I know that there’s other companies that hire similarly to us but usually their bar is not quite as high. They might want more visual design but generally, the bar at thoughtbot all around is high. If I needed someone to be hirable here which we’ve done in the past through our friendship program – I think we’ll be doing a really awesome job and unleashing some seriously terrible monsters in the design field on the city of New York. Does that mean that thoughtbot will be hiring from this program? We are a hiring partner and we do have an office in New York. If anyone’s a fit, we’ll see. I still don’t have any students placed so as soon as that happens, we’ll have a better gauge. Want to learn more about Metis? Check out their School Page on Course Report or their website here! [As of December 8, 2017, Dev Bootcamp will no longer be operating.] The sale of Dev Bootcamp, the first coding bootcamp of its kind in a rapidly expanding space, to Kaplan marked a significant landmark in the coding school world. Kaplan, the test prep powerhouse, lends legitimacy to the bootcamp model as a viable form of education. Other coding schools’ recent fundraising only confirms that the model will continue to grow and perhaps even expand to subject matter beyond coding, like sales, user experience design, and digital marketing. General Assembly raised an impressive Series C round of $35MM in March 2014, and Flatiron School, based in New York, recently pulled in $5.5MM in new funding in April. Irmak Sirer and Laurie Skelly work as data scientists (Irmak is also a partner) at Datascope Analytics, a data-driven consulting and design firm in Chicago. When they met the folks at Metis, who have already proven their propensity for great partnerships with their thoughtbot collaboration, it was clear that a Data Science program was in the cards. Now, Irmak and Laurie are designing the curriculum for the upcoming Metis Data Science course in New York, which is one of the only programs that teaches relative beginners (students don't need PhDs to apply) to be employable data scientists. Tell us about Datascope Analytics and how you got involved with Metis. Laurie: Datascope is a data science consulting firm. We work with a wide range of clients from regional not-for-profits all the way to Fortune 500 and national corporations. People usually ask what kind of data we work with. We’re the kind of firm that uses any data source to help people solve their problems. We’re a very broad, general-purpose firm. Most of us have some kind of academic background and we have continued to come back to the idea of doing some sort of teaching or training. We’re small in size, so finding the bandwidth to run classes and develop new material was really going to be difficult and probably a really long-term idea. We ran into Jason and Bernardo from Metis at the Strata conference, which is a data science conference; I used to work for Kaplan part-time in graduate school. They were looking for data scientists, people with domain knowledge to help develop the curriculum, and we were really excited to find a way to do some teaching and training without having to take care of all the logistic aspects ourselves. Irmak: Laurie first met Jason and Bernardo and the entire Datascope team was really excited about it and I also jumped in on the opportunity. Now Laurie and I are designing the course and we will be the first instructors. We have seen the boot camp model expand to data science and product design, etc. Why do you think that the bootcamp model can work for data science? Laurie: I think that there are a few reasons why it’s a really great option for a lot of people. Usually, people who would consider the bootcamp are comparing it against a master’s program or self-teaching. A couple years ago, there were really no options for Data Science masters degrees, and this year I think there are 40 new ones that are starting. But those will take 1-2 years and they’re usually upwards of $50,000. On the other side, there’s self-teaching. There’s so much available on the internet but it’s really difficult, even for disciplined people to stick with it for the amount of time it takes to learn and be employable. The Metis program is a very happy medium of a 3-month time window where you can take a leave of absence or say, “I’m gonna make the jump and figure this out.” I’m sure that some people will also be sent by their employers. Irmak: I think with something like a master's program, you absorb a lot of theoretical knowledge. Then you start working as a data scientist and it also takes a long time to get familiar with the real life practical applications of that theoretical knowledge and relearning all you were taught. We want to throw you right into the thick of real problem cases and supply the information you need to get through. This gives you valuable experience. Do you expect that students will graduate ready to be junior data scientists at a company? Laurie: Absolutely. There are a ton of people out there who have all or nearly all these skills; they’re just filling in a couple of cracks. I had the experience of knowing a lot of what I needed to know and not understanding what it was called. We come from different academic traditions and a lot of times, when discussing machine learning and regression techniques and modelling, people will be talking about the same space and really have a lot more knowledge in common than they realize. They just need to have that reconciliation. There are also people in the academic world who need to adjust to how different things are in the world of business. I don’t want to hit this point too hard because I think it’s part of the secret sauce of why data science is so valuable right now, but we don’t know everything. Being on a job, we don’t know everything all the time. Data scientists, even the best ones in practice do a lot of Googling. It’s about having that skill and that confidence to apply the solution to the problem even if it’s a problem that you’ve never encountered before. That’s the sort of thing that we can definitely teach in 12 weeks, especially the way that we’ve designed it- the process of fearlessly tackling very technically challenging things, knowing where to look, and knowing how these pieces fit together. This will be your inaugural cohort- do you expect people to have experience with coding or analytics or statistics, or could somebody theoretically be a beginner? Irmak: What we expect is some exposure and experience in statistics and programming but not more than that. We’re actually expecting different people with very different skill sets. I think that there will be people that have a lot of programming experience and have seen a little bit of statistics, maybe in school, but they don’t really do focus on analysis. There could be a student that worked in the sciences, as another example, where they used statistics a little bit and they coded a little bit but they haven’t done anything like data science directly.We would also consider people that do more traditional types of statistics. They’ve done some coding but they’re not that experienced in programming. The idea here is, not everybody is going to gain the exact same skills going through the boot camp. Wherever you are weaker in the big picture of Data Science, you will learn and strengthen that part. And we think that curiosity and creativity, those kinds of personal attributes are also very important; because as Laurie said, a lot of data science is having confidence in your ability to learn something you don’t know, which means that you should be curious and creative with the tools themselves. Laurie: If your question is- are we going to be able to take beginners and make them data scientists in 12 weeks? I would say the answer is “not yet.” Because this is our first class, we don’t know how inexperienced someone could be and still bring them up to speed. Our biggest goal is to be telling the truth when we say in 12 weeks you’ll be able to get a job and not drown in that job. We don’t have any interest in putting people in situations they’re not ready for. Have you thought about what the interview is going to look like? Laurie: Yes! Based on people’s expectations, it’s way more of a culture interview – but there is a technical challenge as well. People think about data scientists and they think about the toolbox and how intimidating it is. But like we said, we really need curious, clever people more than someone with a lot of technical experience. I’d rather have someone who I can tell is going to pick something up quickly or is asking clever follow up questions and is just really listening closely. We’ll probably learn more as we go but for this round, we’re going to be setting ourselves up for a better experience if we find a lot of really good personality matches. These will be our pioneers. What is the technology stack that students learn in a data science boot camp? Irmak: We think of it not only as a technology stack; we think of it as data science dimensions- the domains and the data, algorithms, tools and the visualization/communication part of a project. Basically, we want the graduates to be equipped in all of these dimensions. In terms of data, we’ll be teaching SQL and non-SQL databases. We’ll be teaching about APIs and web scraping, where you could get data from different sources and how to clean that data. In terms of algorithms, we will go over machine-learning algorithms; we will go over regressions, supervised learning and non-supervised learning. The tools you will learn is how to apply those algorithms.We will teach the course using Python as a programming language. There are a whole bunch of packages in Python where you can apply these types of algorithms. In terms of visualization and communication, we think that the communication skills and the presentation and the relationship with the client is very important. We will teach these skills alongside visualization tools such as d3. Laurie: In every project, you have to decide what kind of data you’re using, how do you get it, how do you store it, what are you doing with is as far as algorithms, what are you using to implement those algorithms and when you are done, how are you going to show those results to somebody else? So for each area, or dimension, of data science, we will provide broad exposure to what’s out there so the students have a good sense of the ‘lay of the land’. In each one we’ll also be working from a kind of ‘home base’ - for a programming language, it will be python; for visualization, it will be d3; for databases, we’ll use mongoDB and MySQL. For each of these they’ll have some repetitive use and training, so they will build up a toolkit that they are familiar with, but also understand what alternatives are out there for each piece and be ready to make some changes in the lineup if a job or project calls for it. Of our 12 weeks, we use one of them to spend a lot of focus on d3 because everybody wants to be able to make cool visualizations in d3 and we think it’s worth it. How will your project-based curriculum look? Students will be working on 4 or 5 projects and for each one, there’ll be some kind of output. There are many ways where they might be doing similar algorithms but different people will be picking different data sets so they’ll have different outcomes and it’ll be really interesting for people to express themselves as they’re going. Irmak: I think it’s a great way for them to show how they can tackle a lot of problems for potential employers, instead of just one big project, you get to show completely separate, unique problems that have nothing to do with each other that show all your skills. Has it been a challenge to create a bootcamp curriculum for data science? Laurie: Metis really picked the right data scientists in partnering with Datascope; we’re obsessed with design. When we were at Strata, we were doing a workshop called “Design Thinking for Dummies (Data Scientists).” So this is the kind of stuff we love to chew on anyway. What will a typical day look like at Metis? Irmak: First of all, generally, you will be working on a project. The first project will be just a week, another one 3 weeks long, and so on. You will have questions about how to make progress with your current project, you need to know about the tools, algorithms, approaches. During the day we will give some lectures where you are getting some of that knowledge and then most of the day, you are actually working on that project, applying that knowledge and also, creating new questions. Will students have pre-work once they get admitted and how many hours are you expecting that to take? Laurie: They have online pre-work; we have aimed for a maximum of 30 hours so that people could do it in about 2 hours per day at home, basically 2 weeks. Pre-work focuses on using the command line, Python and some statistics background. They’ll work through some examples from some books that we love and there’ll be some example problems from those books. If they can submit the answer correctly, they’ll pass pre-work. Are you going to have the “personal investment days” that the Ruby on Rails boot camp has at Metis, where they give people free Fridays? Laurie: Yeah; we’re going to have guest speakers come in; we’re going to have more like culture days. There are going to be some cool conferences going on while we’re in New York. That and the fact that we’re enforcing that the day ends at 6 and that people continue being reasonable whole people and will take breaks. It will be important to try to keep people from burning out too hard. Will Datascope Analytics be hiring from the Metis graduate pool? Laurie: We will be a hiring partner, absolutely. We’re really excited to have first look at the fresh recruits. As a goal, it’s absolutely at the forefront of my mind to create a course that can help students get awesome jobs because that’s why people want to be data scientists. In addition to Datascope, we are sharing information about the type of companies Metis should target to become hiring partners. I’m sure you all have amazing insight into who they should be reaching out to. Irmak: Metis is in charge of a lot of the organization but we’re in contact with companies that we worked with, companies that we know and have relationships with and we know are in need of data scientists. Want to learn more about Metis? Check out their School Page on Course Report or their website here. If you're thinking about applying to a coding bootcamp in New York, then you must attend this paneled discussion with top coding schools! Join Course Report and Launch LM in the Hive at 55 downtown space for an evening with alumni from 8 bootcamps. RSVP here to claim your spot- space is limited! Derek Kaknes was sold on Metis because of their association with thoughtbot. A recent graduate, Derek tells us about what drove him to learn to code, the teaching styles that worked best, and how Metis taught him to write code he's proud of. What were you up to before deciding to go to Metis? Before Metis I was working with a small team at a company that I helped co-found. At the company, we had gone through several false starts trying to hire the right software engineer, so I viewed Metis as an opportunity to gain the skills necessary to fill that gap. Did you apply to other bootcamps? Why did you ultimately decide on Metis? I looked at several other bootcamps, including Launch Academy, Flatiron School and DevBootcamp, but ultimately decided on Metis because of their connection with thoughbot. The opportunity to learn thoughtbot best practices from thoughtbot developers themselves was a huge selling point. Which instructors/mentors were especially helpful to you? Did you feel like the teaching methods worked with your learning style? Both of our primary instructors, “Goose” (Matt) and “Steiner” (Josh), were fantastic; but we also had the benefit of other thoughtbot employees dropping in to help whenever they were around. The ability to ask questions and get answers from developers who are in the industry using best practices was enormously valuable. We were taught repeatedly that we should never be “stuck” on a problem in isolation for more than 30 minutes. Whenever I was stuck for more than a few minutes, I would first ask a classmate for help and, if we couldn’t resolve the issue, elevate it to one of the instructors. As a result, I don’t have a great example of being “stuck” in class, but if I had to choose a frustrating experience it would be debugging AJAX requests made to an external API. Tell us about your final project- what technologies did you use, how long did it take, what does it do? My final project was called “BTC Shop” and is an ecommerce shopping application designed specifically for bitcoin payment. The main technologies I used were the Coinbase payment API, which is a pre-built “plug-and-play” option allowing applications to receive btc payments, and the Blockchain API, which is a free third-party API that allows applications to send, receive and track btc payments. Using the Blockchain API, I was able to recreate the functionality of the Coinbase product in my own implementation, including producing a QR Code for user’s to scan and send payments. The whole development cycle took three weeks, including roughly one week for initial research and design. Would you have been able to learn to code and get a job without Metis? No way. I had tried previously to teach myself, but consistently got caught on some early hurdles and never made much progress. Metis provides an awesome platform to accelerate your initial learning curve and, through the association with thoughtbot, enforces current industry best-practices to every line of code that you write. Could I have learned to write code that worked without Metis? Maybe, but not code that I would be proudly confident to show a potential employer. Want to learn more about Metis? Check out their School Page on Course Report or their website. Adam Patterson knew he wanted to make a career change, and turned to Metis, a 12-week Ruby on Rails bootcamp in Boston (and New York), to learn the skills to make the switch. In this Student Spotlight, Adam shares his experience, including what made the instructors effective, how he got support from classmates, and the value of an in-person bootcamp. Before joining Metis I was working in a business development role at an education company. I had a very small amount of programming experience, but enough to know that this was a career change I needed to make. After three years of frustration over not being able to change or improve systems I relied heavily upon, I decided to gain the technical skills to be a true problem solver in today's world. I did not apply to any other bootcamps. I did look into other programs, however already being located in the Boston area limited my reasonable choices. I primarily chose Metis because it was being taught by thoughtbot developers and it was exciting to be part of something new. Both of my instructors were especially helpful. One of the best parts of the experience was that my classmates and I each built a strong relationship with each instructor, allowing us to learn from both of them in a special way. We even had a third instructor join the group toward the end, and he quickly became just as important to us as our main instructors. It's a real testament to the teaching style and approachability of the people at thoughtbot. The instructors did a terrific job of adjusting to our content delivery suggestions on the fly. With over a dozen students at different levels and with unique learning styles, it is difficult to make it work for everyone; I felt as though they did as good of a job as could be expected. Just one time? During the beginning stage of Fail Forward (my final project), I was having a lot of trouble implementing the LinkedIn API and Oauth gem. This was especially problematic because I wanted to get that sorted out before moving on to the rest of my app. I was fortunate enough to have a classmate who used a similar method for his user authentication, and he helped guide me through the implementation. The environment created by the instructors was one of collaboration, and this was an outstanding example of how supportive the group was of one another. My final project was called Fail Forward. It is a place for professionals to share stories of failure, receive feedback from peers in their industry, accumulate knowledge, and become better through failing. I was inspired by a social experiment from high school and the programming mantra of "fail fast, fail often". I used the LinkedIn API and Oauth gem for user login in order to link it to each user's LinkedIn profile. Users could then post their failures within their industry, update their posts with new knowledge, comment on other user's fails, and follow specific fails to find out when they are updated. It is mainly Ruby on Rails, with some JQuery, CSS, and HTML. It took me about 2.5 weeks to get the app where it is today. I think almost anyone could learn to code without a bootcamp. The value of a bootcamp is, of course, learning the essential skills to be job-ready in a much shorter period of time, learning best practices (very important in Ruby), and receiving immediate hiring support. Again, learning from thoughtbot devs was one of the best parts about Metis; I may not have had much prior coding experience, but I have learned only good coding habits and did not have any bad ones to break. What do you do once you've established yourself as a top-notch web consultancy in Rails apps? If you're thoughtbot, you collaborate with Kaplan to create Metis, a 12-week Ruby on Rails course, to fuel the next generation of developers. We caught up with Josh Steiner (of thoughtbot) and Jason Moss (of Kaplan) to find out more about the first Metis cohort, how the program helps graduates find jobs in tech, and what students can expect to learn throughout the course. What is your background and how did you end up in the Code Bootcamp space? Josh: I’ve been working at thoughtbot for over a year now, and before that I was a part of thoughtbot’s apprenticeship program. Prior to my apprenticeship, I was a student at Rensselaer Polytechnic Institute, and while there, I made Rails applications for Major League Gaming. How did you get started with Metis? Josh: Matt (the other instructor) and I are both involved in Learn, which is thoughtbot’s educational venture (we have workshops, forums, and mentoring), and we saw a bootcamp as an evolution of that idea. thoughtbot is known around the world as being an expert in Rails, so this seemed like a great next step. We pitched it to our CEO, Chad, and he actually told us that Kaplan had approached thoughtbot with the same idea. So thoughtbot and Kaplan came together at the same time, wanting to do the same thing. Matt and I were put on the project to design the curriculum and teach these first classes. Tell us about Metis and the relationship that thoughtbot has with Kaplan. Josh: It’s been a wonderful partnership- very collaborative. In some aspects, such as the curriculum, thoughtbot takes the lead, and Kaplan provides expertise (e.g., on learning science and assessment). In other aspects, such as hiring/placement, Kaplan has taken the lead and thoughtbot is assisting by leveraging our client network to identify hiring partners. They’re a great group to work with, and you can tell they are very passionate about what they are doing. When is your first cohort? Our first class is Feb 24, and you can apply for the June cohorts in Boston and New York on our website. There will be more to come after that, but so far, those are unannounced. How many people are you seeing apply for the first cohort? Josh: We’re at a number we’re happy with for the first class, especially with only two months to get the word out and launching over the holidays. We wanted a slightly smaller class for the first time. We have seen a ton of interest, however. People see thoughtbot on the ticket and the class appeals to them because of that. We would like to get people to the level of an apprenticeship at thoughtbot, but unfortunately we can’t hire everyone. Hopefully, a few of them will end up working at thoughtbot. What are you looking for in potential students? Do they need programming experience? Josh: People need to be comfortable with the computer, but they don’t need to have done any programming in the past. We’re mainly looking for three traits: drive, grit, and communication. We think that these are the most important qualities of a good programmer, and are particularly important for somebody who is going to learn to program in such a short amount of time. What can a potential student expect to see in the admissions process? Josh: We have an application on our website, and then filter students for an interview to better understand their motivation, goals, and familiarity with Metis. We also ask some technical questions to understand how they approach and solve problems. Describe the partnership Metis has with Upstart. Can you give us a quick run-down of the curriculum? What’s your teaching style? Josh: The curriculum is broken into three parts- the first 7 weeks will be teaching the fundamentals of programming. We’ve designed an application, and through the application, we’ll exercise all of the things that we think good web developers need to know. Each day, Matt and I will present a problem to the class (eg. “how can we get users to log into our site”) and then teach them what they need to know to solve the problem. Then we’ll all program it together. By doing it this way, they get to see how experts approach problems. By hearing why we make decisions, instead of us just telling them “this is the way to do it”, they will be able to apply that knowledge in other scenarios, as well. The next two weeks will be a team programming project- we’ll emulate a client project, and they will see how we work at thoughtbot every day. Matt and I will come to them with a few ideas, the team will pick and plan out the project, and program that collaboratively for the next two weeks. The last three weeks will be their capstone project. This is a solo project, and it’s something they will be passionate about, because they picked the project themselves. Up to that point, they’ll get small homework assignments (wireframes, database diagrams etc), so that on Day 1 of their capstone project, they can just sit down and start programming. Also, during the first 7 weeks, we’ll have an “Investment Day,” which is modeled after something we have at thoughtbot. On Fridays, students can work on anything they want. Some students may want to reinforce subjects that they have struggled with. Others may take the opportunity to work on open source, pair program, or build a small app on their own. How does Metis help your graduates find jobs in tech once they've completed the program? Jason: Metis has a full-time Employee Placement Specialist on our team, whose primary responsibility is to help our graduates find jobs. This person is a resource, who can help with everything from resume-writing and interviewing to career coaching and company targeting. Everyone at Metis will also participate in a Hiring Day at the end of the 12 weeks. The Hiring Day is an opportunity to meet directly with employers who are interesting in hiring entry-level Ruby on Rails developers, and specifically, Metis graduates. Also, once they've graduated and while they're looking for jobs, we provide them with 3 months of online professional development through thoughtbot's Learn Prime so that they can keep sharpening their skills. Can you explain the relationships that Metis has with partner companies? Who are some of your partner companies? Jason: Some of our Hiring Partners include: CoachUp, Constant Contact, Iora Health, LevelUp, WegoWise, 3PlayMedia, Wistia, and of course, thoughtbot and Kaplan. We'll be adding many others in the near future. Hiring Partners are not required to hire our graduates, but they do agree to attend and interview graduates from at least one Hiring Day and then they give us feedback on the graduates. We give the hiring partners our students’ resumes and code samples, and we work to understand their needs and optimize our curriculum accordingly. Do you get a recruiting fee for placing a student with a partner company? Does the student get a tuition refund? Jason: Yes, we get a 20% placement fee, which is paid within 30 days of the student’s start date. A student who is placed and stays at a Hiring Partner gets a $2000 tuition refund. Tell us about the Boston tech scene- why does Boston need a bootcamp right now? Josh: The main reason this is our first location is because thoughtbot is headquartered in Boston, and we’re close to New York, where Kaplan is located. In addition to that, Boston has a great tech scene. We have an awesome Ruby group in Boston and we have two Ruby events each month, which are great opportunities for students to network. There are usually announcements with multiple companies hiring at both of these events. To learn more about Metis, check out their course page or visit their website! Course Report is featured on the Kapor Center blog! Coding bootcamps are producing graduates that enter the workforce almost immediately, so their approach to recruiting and retaining students from underrepresented backgrounds may quickly start to define, and potentially diversify, the landscape of the tech industry. One way to reach out to potential students is through scholarship programs. Check out the full article on the Kapor Center blog to see a full list of coding boot camps currently offering scholarships specifically to underrepresented minorities. Any other information you'd like to share with Amy Ramnath from Metis? By submitting, I acknowledge that my information will be shared with Metis. An email with these details has been sent to Metis. You've already applied to this scholarship with Metis.